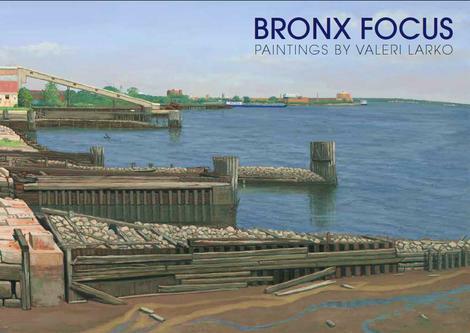 For over thirty years, Valeri Larko has drawn inspiration for her paintings from the dilapidated industrial landscapes of New Jersey and New York. She focuses on the collision between nature and man-made infrastructures evident in forgotten side streets, waterways, derelict factories, and salvage yards, revealing stories that exist at the fringes of city life. Working in the nineteenth century tradition of painting en plein air, or outdoors, is central to Larko’s practice, as she spends months or years working on her canvases directly in the presence of her subjects. In 2004, Larko moved to New Rochelle, NY, a transition that led her to explore a new, neighboring location in her paintings: The Bronx. The works in Bronx Focus: Paintings by Valeri Larko serve as a record of the vibrant graffiti culture as displayed in structures throughout the borough now, and on the verge of extinction. Other paintings showcase glimpses of the salt marshes and creeks that have managed to thrive within the urban sprawl. Larko’s paintings remind viewers of a Bronx that coexists as both a city and nature reserve, capable of gritty and touching beauty, while also focusing on themes of memory, preservation, and expansion. Valeri Larko was educated at the Du Cret School of the Arts, Plainfield, NJ and the Arts Students League, New York City. She lived in Northern New Jersey most of her life surrounded by endless miles of industrial parks, highways and shopping malls, all of which have contributed to her fascination with the built environment. Based in New Rochelle, NY, Larko currently explores various sites around the Bronx, Brooklyn, and Queens.